LAKELAND – Listening to Delbert and Sandy Groves zip through the various aspects of their work in a niche of southern Africa called Zambia can be a little dizzying. 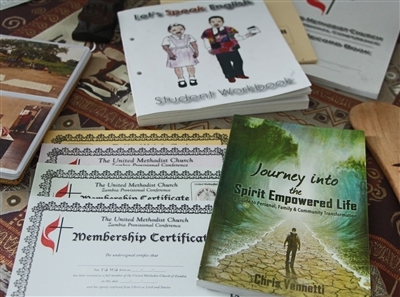 The New Life Center print shop in Zambia not only provides skills training for people in Kitwe but publishes materials for spiritual nourishment. Above are samples displayed by missionaries Delbert and Sandy Groves. 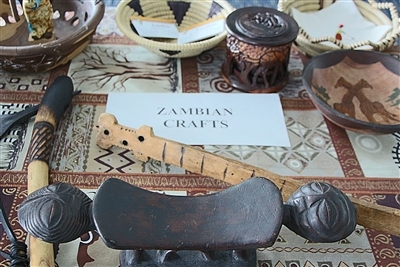 Below are Zambian crafts shared during the missionaries' visit to the Florida United Methodist Center. Photos by Susan Green. The New Life Center they started in Kitwe offers programs in health and nutrition, education, gardening, prison ministry, evangelism and spiritual formation, job services, printing and distributions of a gizmo that helps people immobilized by disease or injury get around on their own again. Most missionaries spread the gospel through a specialized ministry, such as agriculture, teaching or medical services, said Delbert, an ordained elder and Florida Conference member. “For some reason, the Lord has put it on our lives to be involved in many ministries,” he told an audience this week at the Florida United Methodist Center. Although Christianity is the official religion of Zambia, United Methodists had almost no presence in Kitwe when the Groveses opened the center 15 years ago. Worshipers began meeting in homes, rented school classrooms and even under trees, Delbert said, and the number of Methodist congregations swelled from five to about 100. Five years ago, through partnerships with sister churches in the U.S., New Life began building churches at the rate of about two a year. Currently there are 10, and plans are to step up the pace to three a year. Although mainstream Protestant denominations, including The United Methodist Church, are declining in the U.S., the Christian message has been well-received and sparked growth in Africa, Delbert said. The couple previously worked for eight years in the Democratic Republic of Congo before civil unrest prompted them to move south to Zambia. In some ways, the move offered a chance to plow a new mission field with a fresh missionary approach, cognizant of past mistakes, Delbert said. In the past, Methodist efforts to help lift African people from poverty while spreading the gospel had unintentionally fostered a spirit of dependence on charity, he explained. Also, the Methodist denomination’s structure has great appeal in African societies where tribes are organized with clearly defined roles, but sometimes, because of cultural traditions, the leadership roles in the church can be misinterpreted. Rev. 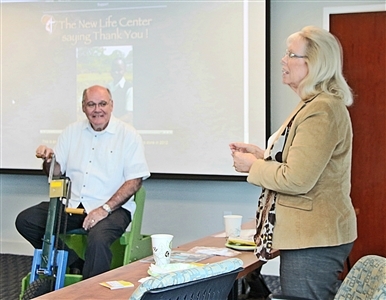 Delbert Groves, left, shows a Florida United Methodist Center audience how a PET vehicle works as his wife, Sandy, talks about the many ministries offered at New Life Center in Kitwe, Zambia. “Everyone wants to become the chief,” Delbert said, adding that the missionaries’ work with pastors and church leaders in Zambia includes actively promoting the idea of finding satisfaction in serving others. In addition to offering aid to orphans and disadvantaged children in the area, the New Life Center also offers education assistance to pastors’ children and actively seeks ways to help pastors increase their income so that they can support families while doing the work of the church. Among the most rewarding ministries listed by the couple are school exam preparation programs for children who struggle with English and math. English is the official language of Zambia, and although children can get by with minimal skills in the lower grades, they must be able to speak and write well in English to pass exams for the eighth grade and beyond, Sandy said. The program started five years ago with a retired Zambian teacher and Sandy teaching English, writing and phonics. Sandy recently added math to the list of subjects students can receive tutoring in. About 50 children and 10 adult women who wanted to go back and take their Grade 9 exam attend afternoon sessions at New Life. Although the program has helped some students move up and pursue higher education, it has also led to the conclusion that some students will not achieve the necessary skills for high school and college, Sandy said. New Life is working on a plan for a technical school that can help them better their lives. 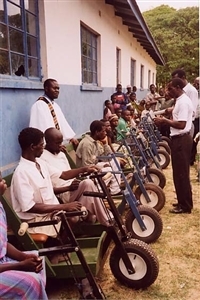 Recipients who have lost the use of their legs prepare to roll away to a new life at a monthly distribution of PET mobility vehicles at the United Methodist mission in Kitwe, Zambia. Photo from New Life Zambia. “We’re trying to meet the needs of where they are,” Sandy said. The center also offers computer classes for the many residents who otherwise would have no access to modern technology. Also rewarding, her husband said, is the PET (Personal Energy Transportation) Project, which provides hand-powered, wheeled vehicles to people who have lost the ability to walk because of disease, birth defects, land mines or other injuries. New Life makes and distributes 50 of the life-changing devices a month to people in Zambia and nearby Malawi and Congo. Delbert said the center hopes to add Angola, where the Florida Conference is in mission partnership, to the list of service areas soon and also double production. People who receive a PET vehicle not only gain independence and the ability to make a living and care for children but regain a sense of self-esteem in a culture that shuns them. “All of a sudden, they become a celebrity because we hand them one of these PETs and say, ‘In the name of Jesus, get up and roll away,’” Delbert said. The couple is booked for church presentations in Florida before they return to Zambia in March to prepare for the annual Holy Spirit Encounter, a revival that draws hundreds for spiritual nourishment. Church leaders interested in booking a presentation about the mission for January or February 2016 can email groves@newlifezambia.com or call (407) 257-6604. For more information about the mission, visit www.NewLifeZambia.com.